Amazon, Netflix and 100,000 others are urging resistance to a U.S. watchdog’s plan to scrap rules on so-called net neutrality. Broadband provider AT&T is among them, with its own arguments. The common thread is that companies shouldn’t be able to choose which content gets online. 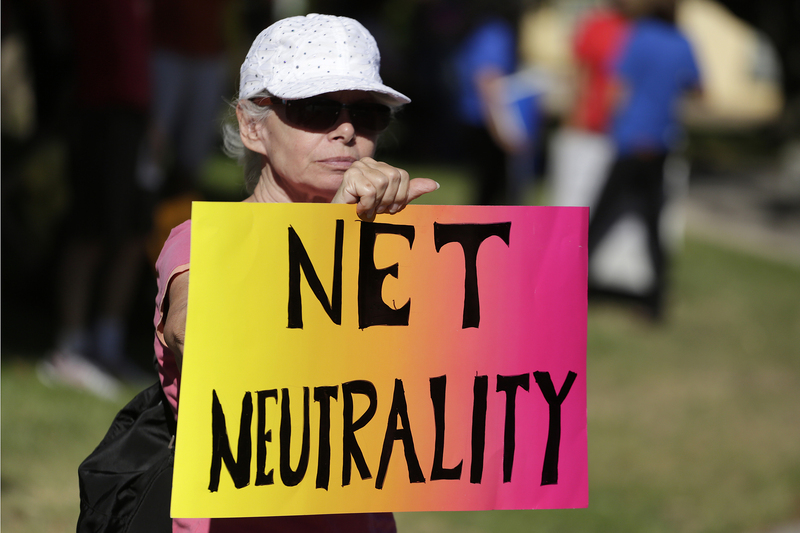 Lori Erlendsson attends a pro-net neutrality Internet activist rally in the neighborhood where U.S. President Barack Obama attended a fundraiser in Los Angeles, California, U.S. July 23, 2014. More than 100,000 tech firms, including Facebook, Amazon.com and Netflix, are supporting an “internet-wide day of action to save net neutrality” on July 12. Many participating sites are displaying ads, short videos and other features aiming to persuade consumers to oppose the reversal of 2015 net-neutrality rules. In May, the U.S. Federal Communications Commission voted two-to-one to reverse an order devised under President Barack Obama’s administration in 2015. The commission, now headed by Donald Trump appointee Ajit Pai, wants to repeal the reclassification of internet service providers as akin to telecom utilities under “Title II.” The public will have until mid-August to comment before the FCC votes on the final plan.